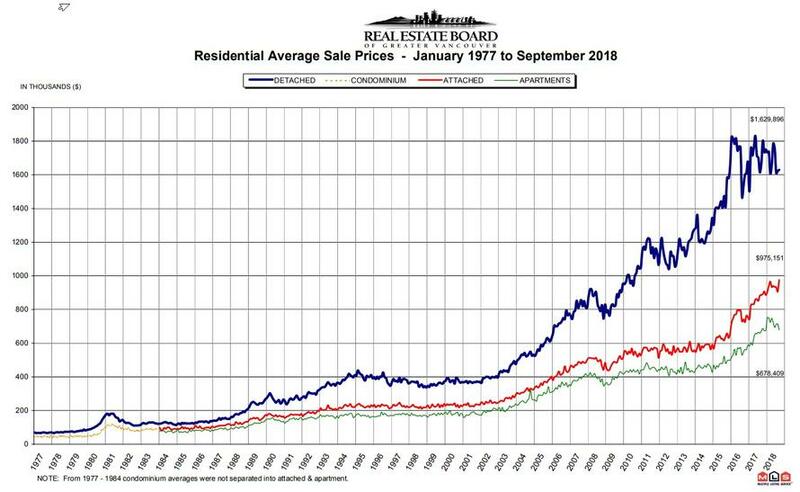 That's what happened in Vancouver housing in September, when according to the Real Estate Board of Vancouver (REBGV), residential property sales tumbled by 17.3% from August 2018, and a whopping 43.5% from one year ago. In fact, a total of only 1,595 transactions took place as both buyers and sellers continue to sit on their hands amid confusion whether the recent torrid price gains will continue or whether the housing bubble has burst. Sales of detached properties in July was just 508, a decrease of 40.4% from the 852 recorded in September 2017, and the 812 apartments sold was a 44% drop compared to the 1,451 sales in September 2017. And no, it's not seasonal: last month’s sales were a whopping 36.1% below the 10-year September sales average. The reason for the collapse in transactions: the formerly all too willing buyers, mostly Chinese oligarchs who would use Vancouver real estate as their offshore Swiss bank account, have disappeared. Meanwhile sellers are dumping properties in the market in hopes of a quick flip. “Fewer home sales are allowing listings to accumulate and prices to ease across the Metro Vancouver housing market,” Ashley Smith, REBGV president-elect said. "There’s more selection for home buyers to choose from today. Since spring, home listing totals have risen to levels we haven’t seen in our market in four years." Sure enough, there were 5,279 detached, attached and apartment properties newly listed for sale on the Multiple Listing Service in Metro Vancouver in September 2018. This represents a 36% increase compared to August 2018 when 3,881 homes were listed. Separately, the total number of properties currently listed for sale in Metro Vancouver was 13,084, a 38.2% increase compared to September 2017 (9,466) and a 10.7% increase from just one month prior, when 11,824 properties were listed in August 2018. Curiously, despite the dramatic slowdown in the market, prices remained at nosebleed levels suggesting that sellers are still not in a rush to sell. The composite benchmark price of a home was just over C$1 million, a three per cent decrease over the past three months but up 2.2 per cent from September of 2017. Detached homes sold for an average of C$1.541 million, down 4.5% from a year ago, and apartments averaged C$687,00, up 7.4% from July 2017. The overall composite benchmark price fell just 0.6% in July to C$1.09 million, which is still up 6.7% from a year earlier, up 3.1% over the last three months, and remains unreachable for most ordinary buyers. The report signals buyers are still adjusting to tougher mortgage qualification rules the federal government introduced Jan. 1, and more worryingly, to the four increases in the Bank of Canada’s interest rate over the past year. Those rules were put in place after surging prices in both Toronto and the Pacific coast city led to warnings about excessive speculation. Other levels of government have also cracked down. British Columbia’s provincial government imposed a tax on foreign buyers, and Vancouver is trying to deter property speculators with a levy on vacant homes. So will prices catch up to the collapse in sales? According to the REBGV, for all property types, the sales-to-active listings ratio for September 2018 is 12.2%. By property type, the ratio is 7.8% for detached homes, 14% for townhomes, and 17.6% for condominiums. In other words, with the surge in detached listings coupled with the lack of declining prices, all that Vancouver's real estate market needs is a spark that launches the selling deluge; however since the bulk of purchases were made "all cash", and in most cases sight unseen by Chinese oligarchs, it is unlikely that further monetary tightening will be the catalyst that finally pops one of the world's biggest housing bubbles.